The keynote address by danah boyd, founder and president of Data & Society, a research institute focused on understanding the role of data-driven technologies in society. She also is a principal researcher at Microsoft Research and a Visiting Professor at ITP at New York University. Her research focuses on the intersection of technology, society and policy. She presently is examining questions related to bias in “big data” and artificial intelligence, how people negotiate privacy and publicity, and the social ramifications of using data in education, criminal justice, labor and public life. For more than a decade, she studied how American youth incorporate social media into their daily practices in light of different fears and anxieties that the public has about young people’s engagement with technologies like MySpace, Facebook, Twitter, YouTube, Instagram, and texting. She has researched a plethora of teen issues, ranging from privacy to bullying and racial inequality to sexual identity. The Financial Times dubbed boyd “The High Priestess of Internet Friendship” while Fortune Magazine identified her as the smartest academic in tech. A plenary session, featuring a conversation between Esra’a Al-Shafei, a Bahraini civil rights activist and founder and executive director of Mideast Youth and its related projects, including CrowdVoice.org, and Henry Jenkins, the Provost’s Professor of communication, journalism and cinematic arts at the University of Southern California. Al Shafei has worked using networked communications to build platforms which deploy new media tools to amplify the voices of oppressed and underrepresented groups in the Middle East. Jenkins has headed the Media, Activism, and Participatory Politics Research group, which has sought to better understand the political lives of American youth, who are seeking to change the world “by any media necessary.” Their conversation is titled: “Do We Still Believe That Networked Youth Can Change The World?” They will compare notes, reflecting on what is known now that was not known a decade ago, after the Arab Spring, after Occupy, after #blacklivesmatter, and the Trump era, about the ways young people may or may not be able to use social media to bring about social change. A panel discussion on how families connect and learn digitally, moderated by Mimi Ito, director of the Connected Learning Lab and research director of the Digital Media and Learning Research Hub at the University of California, Irvine. Several other panel discussions covering topics from games and learning research, innovations for teachers’ professional development, supporting youth in creative online communities, addressing tech access and equity issues, connected learning in libraries, community initiatives, learning systems and online craft endeavors to media and technology for cognitive enhancement, mobile science, design and web annotation. The popular five-minute Ignite talks at the end of each conference day, Oct. 5 and 6, promise to entertain conference attendees. The speakers will be announced soon. 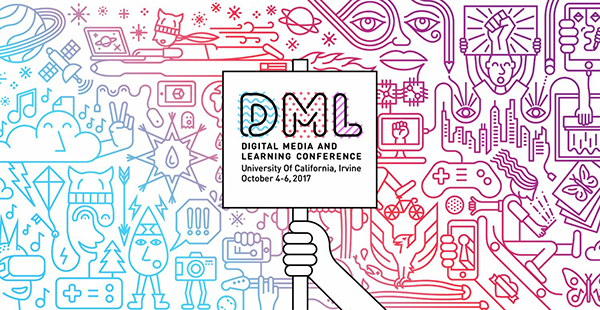 DML 2017 also features a pre-conference workshop day Oct. 4. The event will be held at UC Irvine. Registration is available online. For more information about the conference and for schedule details, visit dml2017.dmlhub.net.